Whether pulled up to the kitchen table for a quick breakfast or lending a pop of color to a restaurant seating group, this versatile chair?s simple shape will round out any ensemble. 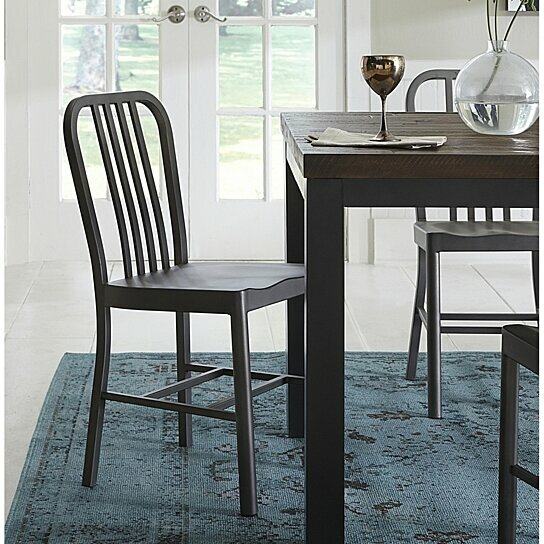 Sporting a clean lined design, its matte gunmetal gray finished metal frame features a vertical slat back design and a saddle style seat to provide more comfortable seating surface. Suitable for both indoor and outdoor use, this chair works seamlessly in any modern home boasting durability, comfort and a look that is sure to turn a few heads. Other featured items in the image except this chair are sold separately. One Chair with footrest only. The chair features a slat back design and a saddle-style seat to provide more comfortable seating surface. The chair is bolstered by stretchers to provide stability.